In everyday life, ultraviolet, or UV, light earns a bad reputation for being responsible for sunburns and other harmful effects on humans. However, research suggests that UV light may have played a critical role in the emergence of life on Earth and could be a key for where to look for life elsewhere in the Universe. A new study by Sukrit Ranjan of the Harvard-Smithsonian Center for Astrophysics (CfA) in Cambridge, Mass., and colleagues suggests that red dwarf stars might not emit enough UV light to kick-start the biological processes most familiar to our planet. For example, certain levels of UV might be necessary for the formation of ribonucleic acid, a molecule necessary for all forms of known life. "It would be like having a pile of wood and kindling and wanting to light a fire, but not having a match," said Ranjan. "Our research shows that the right amount of UV light might be one of the matches that gets life as we know it to ignite." This research is focused on the study of red dwarf stars, which are smaller and less massive than the Sun, and the planets that orbit them. 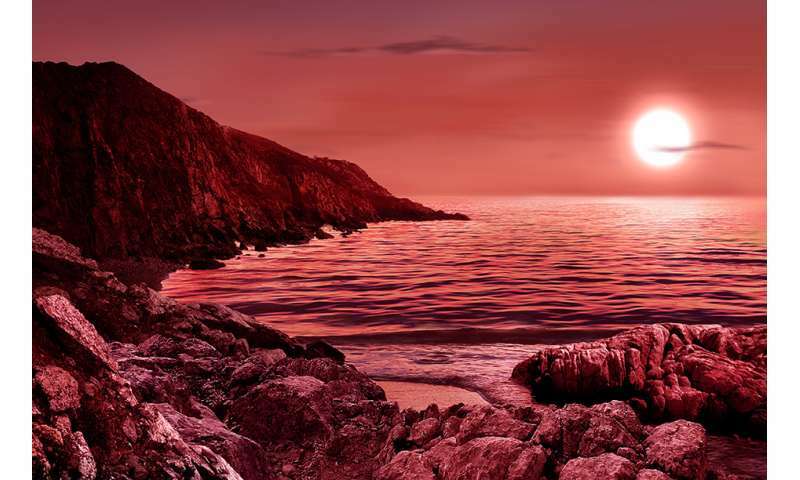 Recently, several planetary systems with potential habitable zones, where liquid water could exist, have been discovered around red dwarfs including Proxima Centauri, TRAPPIST-1, and LHS 1140. Using computer models and the known properties of red dwarfs, the authors estimate that the surface of rocky planets in the potentially habitable zones around red dwarfs would experience 100 to 1,000 times less of the ultraviolet light that may be important to the emergence of life than the young Earth would have. Chemistry that depends on UV light might shut down at such low levels, and even if it does proceed, it could operate at a much slower rate than on the young Earth, possibly delaying the advent of life. "It may be a matter of finding the sweet spot," said co-author Robin Wordsworth of the Harvard School of Engineering and Applied Science. "There needs to be enough ultraviolet light to trigger the formation of life, but not so much that it erodes and removes the planet's atmosphere." Previous studies have shown that the red dwarf stars in systems such as TRAPPIST-1 may erupt with dramatic flares in UV. If the flares deliver too much energy, they might severely damage the atmosphere and harm life on surrounding planets. On the other hand, these UV flares may provide enough energy to compensate for the lower levels of UV light steadily produced by the star. "We still have a lot of work to do in the laboratory and elsewhere to determine how factors, including UV, play into the question of life," said co-author Dimitar Sasselov, also of the CfA. "Also, we need to determine whether life can form at much lower UV levels than we experience here on Earth." There is intense interest in probing these questions because red dwarf stars provide some of the most compelling candidates for detecting putative planets with life, including those mentioned above. As telescopes such as the James Webb Space Telescope and the Giant Magellan Telescope come online in coming years, scientists need the most information possible to pick out the best targets in their search for life outside our Solar System. One limitation of these studies is that we know only one example where life formed on a planet, the Earth, and even here we are not certain exactly how life emerged. If life is found on a red dwarf's planet, it might imply a pathway to the origin of life that is very different from what we think might have played out on Earth. These results were published in the July 10th, 2017 issue of The Astrophysical Journal and are available online. It seems that if we're to find other life in the universe, it's increasingly unlikely it's going to be similar to us. If this is the case RET (rare earth theory) just got a lot stronger as red dwarfs make up approx. 70% of the stars in our universe. The universe gets a lot smaller when you do that. Seems to me that Dr. Pierre-Marie Robitaille may be correct in that suns like ours change their lattice and become some other kind of star. I am not a follower in the science that says novas are the flagships of life and minerals. I suspect that stars like our sun Sol, emit gas spheres that detach. THEY are the red and brown dwarfs everywhere so that explains why they are so common. Gas burps from stars. The may enable stars to maintain and not build internal pressure. So what happens to these pressurized, highly magnetized gas spheres? If they encounter a planet AND an iron meteorite in the same time frame, you may get an iron shellacking on the bodies. The result: an Earth with iron deposits over the original surface. We call it the MOHO. The gas sphere also acquires an iron shell and becomes a planetary body in orbit around the planet, we call it the Moon. What will we call Venus when this event --this seemingly very common event---creates a new surface there? Envy. Hollywood optioned interpretations of what life could be like on other worlds created by astronomy writer Terrance Dickenson (Canadian). None of what he postulated bore any resemblance to humans. And nothing that evolved on this planet prior to dinosaurs and mammals was even remotely like life is now. So yes, it is unlikely anything like what we see here will evolve on other planets.